The Season of Love is a special time at our Wolf Hybrid Puppy Ranch in Northern California. Although the air may be crisp in the wolf den, the passionate language of love is being howled at the moon every night by the mating wolf dog pairs as they prepare for a Spring of new domestic wolf puppies. The wolves don their Hollywood superstar finest in their late winter coats as they parade through the forest. And you think maybe you hear wolves kissing in their wolf den lodges. The season turns magical at the great wolf dog puppy ranch with the birth of wolf cubs and the joy on the faces of the happy families as they welcome their new wolfdog pup. Take a tour of our Wolf Hybrid Ranch and get to know our precious puppies for sale. Wolf Dog Hybrids are better than wolves and they make great pets. Now, come on in and meet the wolves. Mikho and Odin puppies are high content, large wolf hybrid pups. Both mom and dad love to be loved. These wolves will love your attention and affection. Odin is a pure white Mackenzie Valley Wolf dog and Mikho is a Timber wolf hybrid. These are very large pups. This litter was born on December 10, 2011. If you have questions, or want to know whether you are the right person to buy a wolf, call Wolf Dog Ranch Breeder Edye at 530-990-2308 or email edyemarin@gmail.com. Nieve - Female - PURE WHITE (white phase) Wolf Hybrid Puppy for sale Mackenzie Valley and Timber Wolf. CKC Registered. Ala (short for Alabaster) - Male - PURE WHITE (white phase)Wolf Hybrid Puppy for sale Mackenzie Valley and Timber Wolf. CKC Registered. Andre - Male - PURE WHITE (white phase) Wolf Hybrid Puppy for sale Mackenzie Valley and Timber Wolf. CKC Registered. Sold Polar - Male - PURE WHITE (white phase) Wolf Hybrid Puppy for sale Mackenzie Valley and Timber Wolf. CKC Registered. 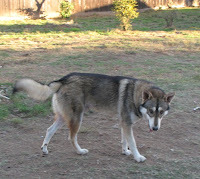 Shiwi - Female - Tri Color Wolf Hybrid Puppy for sale Mackenzie Valley and Timber Wolf. CKC Registered. Mack - Male - Tri Color Wolf Hybrid Puppy for sale Mackenzie Valley and Timber Wolf. CKC Registered. high content wolf dogs. They are big wolf pups. Mother is Kimi - large, high-content Timber Wolf Dog (click here for Kimi's Blog) and Father is Zev - high-content, very large Mackenzie Valley Wolf (click here for Zev's Blog). Litter is CKC Registered. SOLD Pyre - Male - Wolf Hybrid Puppy for sale Mackenzie Valley and Timber Wolf. CKC Registered. Sold R.C. (short for Roberto Clemente) - Male - Wolf Hybrid Puppy for sale Mackenzie Valley and Timber Wolf. CKC Registered. Alexis (short for Alexis Sanchez) - Male - Wolf Hybrid Puppy for sale Mackenzie Valley and Timber Wolf. CKC Registered. Sold Achro - Female - Wolf Hybrid Puppy for sale Mackenzie Valley and Timber Wolf. CKC Registered. Sold Joel - Male - Wolf Hybrid Puppy for sale Mackenzie Valley and Timber Wolf. CKC Registered. sold Lucy - Female - Wolf Hybrid Puppy for sale Mackenzie Valley and Timber Wolf. CKC Registered. Maki and Cody produced beautiful medium content wolf hybrid puppies. They are very big. For those who prefer a mid-content wolf dog with a sweet nature, these are the wolf puppies for you. Maki, the mother, is a Timber Wolf Hybrid with Malamute and Cody, the father, Timber Wolf and Norwegian Elkhound and Malamute. This fine litter of wolf dog puppies was born on December 6, 2011. Vlčiak - Female - Wolf Hybrid Puppy for sale Timber Wolf. CKC Registered. Ulfur - Female - Wolf Hybrid Puppy for sale Timber Wolf. CKC Registered. Kos (short for Kostbaar) - Male - Wolf Hybrid Puppy for sale Timber Wolf. CKC Registered. 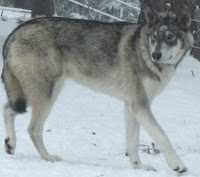 Sold Pretiosa - Female - Wolf Hybrid Puppy for sale Timber Wolf. CKC Registered. Guapo - Male - Wolf Hybrid Puppy for sale Timber Wolf. CKC Registered. Sold Thor - Male - Wolf Hybrid Puppy for sale Timber Wolf. CKC Registered.